Attorney General Roy Cooper's campaign ads attack Governor Pat McCrory's record on education funding. 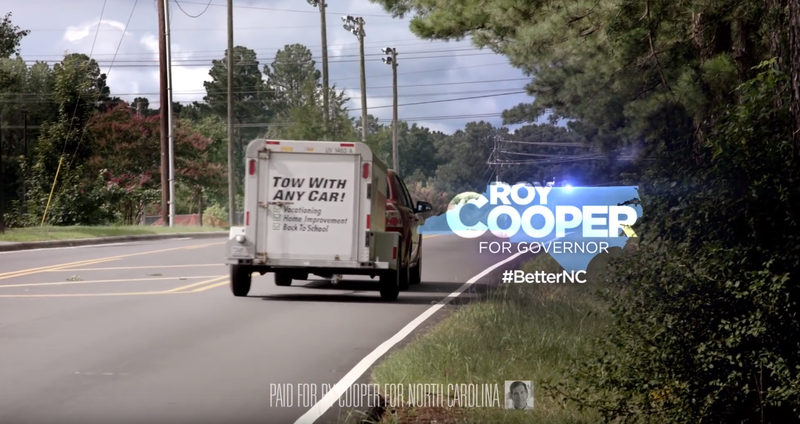 Cooper’s campaign video “Fix This” features a Durham County teacher identified as “Adelle B.” packing up her house with her husband and pulling away in a moving truck. “Like over 2,000 other teachers, I’m having to move to another state so I can do what I love and make ends meet,” she says. So, have more than 2,000 teachers left to teach in another state since McCrory took office? And is that unusual? Yes. Since McCrory took office in the 2012-2013 school year, 2,217 teachers have left to teach in another state, an unusually high number for a three-year period. Records from the Department of Public Instruction show a 36 percent increase in the number of teachers leaving the state to teach elsewhere from the 2012-2013 school year to the 2014-2015 school year (the latest numbers we have). Credit Data from the North Carolina Department of Public Instruction. It’s important to keep in mind, however, that we’re talking about a relatively small number of North Carolina’s 96,000 teachers. During McCrory’s time in office, the number of teachers who left to teach in another state ranged from 0.48 percent of the teaching force to 1.07 percent. We should also note that the report doesn't say why teachers left for another state, so we don't know if, like Adelle B., they left because of the state's relatively low teacher salaries. Adelle B. also says, “We’ve fallen to 41st in teacher pay; 44th in per-student spending." Kind of. The numbers are right, but not the characterization. We don’t know when Adelle B. started working in North Carolina. Maybe the state fell in the rankings since she began teaching here. 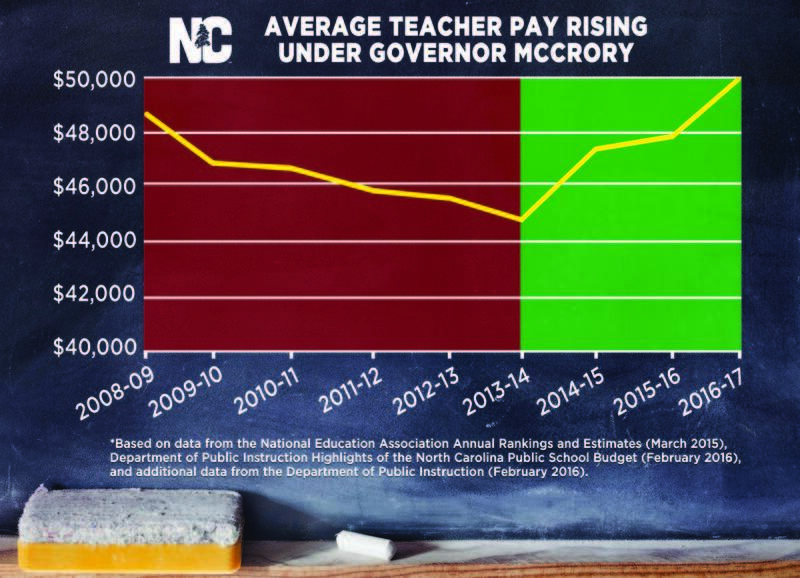 But reports from the National Association of Educators (NEA) show that over McCrory’s time in office, the state has gone up in the national rankings, not down. When McCrory took office, North Carolina ranked 46th in the nation in average teacher pay and 49th in per-pupil spending. The NEA's latest estimates show the state has risen to 41st in teacher pay and 44th in per-pupil spending. Governor Pat McCrory has made the rise of teacher pay a centerpiece of his bid for reelection. The image above shows the upward climb in average teacher salaries since the 2013-2014 school year. It has appeared behind the governor at public events, including the signing of the 2016-2017 state budget.